When measuring the width of your window for your net curtain, you must measure the recess width. This is shown by the horizontal arrow in the diagram to the right. We recommend you measure the width in several places and then take the shortest measurement. For appropriate fullness/gather in your net curtain, we recommend multiplying your calculated width by 2. 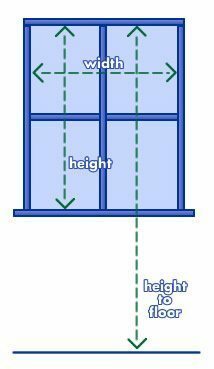 When measuring the height of your window for your net curtains, you must measure the recess height. Again, we recommend you measure the height in several places and then take the shortest measurement. If you need any advice whatsoever about measuring please do not hesitate to contact us by phone (+353-1-8744606), email (sales@duffyscurtains.com) or in person at 27 North Earl Street, Dublin 1.